Post all about the latest fights here. Had to make a new one as we're cutting down pages in topics right now. Anyone want to be WAMMA Champion? So if I win I get Fedor and the Belt? Just one, I'm a few. No family too. What am I? Fedor might come back to fight before the end of the year. Imagine if what you're bidding on is to fight Fedor for the belt instead of bidding for the belt itself. Kendell Grove, Andrei Arlovski and Reagan Penn (BJ's younger brother) all picked up wins on ProElite's first show back since closing down in 07. Im starting to think Chael Sonnen is pretty racist. Im really strangely ok with this. How so? Because Sonnen has been constantly attacking Brazilians in order to get himself some attention or because he hasn't bashed a full blooded, white American fighter yet? The second one. I figured the Stann bashing would start but it hasn't and listening to him on the MMA Hour pretty much confirms that he is racist. He bashes anyone non-American. But its so funny, idk. If Chael Sonnen will be known to talk trash, he might as well talk trash about everyone. Tell Stann broke the "Don't Ask, Don't Tell" inner law, he was too much of a coward to run from war or something. Hell, even he can say that Stann's jawline is freaking huge but Chael can't get picky now on who he's going to bash. Did anyone watch UFN 25? I caught the last two fights, Shields wasn't into to his fight and McGee got stamina for *censored*ing days. Yeah Shields' match was kinda weird. I was shocked he lost. His dad died recently, so it's understandable why he didn't seem into it. He should've just pulled out and given the fight to someone else. Same goes for Forrest at UFC 134. He knew 9 months prior to the fight that his wife was pregnant. He shouldn't have accepted it because ultimately, he'll be pushed further down the ladder. All this and the fact that Shields is pretty overrated and should be fighting at Middleweight. I know his dad died. I just thought that would push him more you know. Yeah i was really hope for him to get the win, the post fight would be have been so emotional. You know that Skyrim 'arrow-to-the-knee' meme? 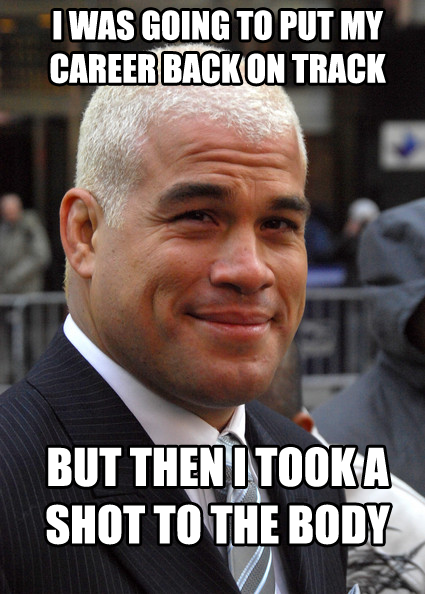 Well, I thought we could have a Tito Ortiz 'shot-to-the-body' meme! You're better that that Joel. Michael Stann isn't a rascists. I've met him and his training partners are black and Latino.